The majority of people who are thinking of an epoxy floor coating or paint for their garage usually imagine a boring battleship grey color. If you want to have a garage that looks better because you want to sell it faster or you really like a garage that POPS, then this grey color cannot do anything for you. Well, if this is your way of thinking, then you are in great luck. Now, you can have an epoxy floor paint in more colors than you ever thought possible and chip systems with countless combinations of colors. At Southeast Floor Prep, our Florida concrete Epoxy Floor Coating offer high quality epoxy flooring services for your concrete floor. You can make a garage look just as nice as the rest of your home. Putting an epoxy floor coating on your Florida area garage will make it feel like another room in your home. Is your garage floor (man cave) cracked, chipped, stained or overall unappealing? Tired of trying to clean those concrete floors and unsuccessfully in making them look decent? Consider investing in our professional Florida garage floor epoxy coating services. Southeast Floor Prep garage floor epoxy coating systems are true, commercial-grade floor coatings available in several colors and decorative options to fit virtually any style. Our garage floor epoxy coating services are industry proven and trusted by homeowners and commercial property owners alike. With our garage floor epoxy coating services, we will protect, beautify and make your concrete garage floors safe. In comparison to the bare concrete garage floors, epoxy concrete floors require minimum maintenance and offer improved resistance to stains, corrosion and cracks. Why waste your time scrubbing, cleaning or painting your garage floor, when our South Florida garage floor epoxy coating can protect your garage against wear and tear? Our garage floor epoxy coatings are the most economical, aesthetically pleasing way to enhance a plain gray concrete garage floor, doing wonders for the appeal and resale value of your home. There’s practically no reason that your garage should remain a dingy and unpleasant place. A garage floor coating like epoxy minimizes the need to constantly make repairs and clean up the floor. Renovating your garage? Start from the floor up. Let our concrete contractors apply a proper coating of epoxy to your garage floors and see just how amazingly it spruces up your ugly, old looking garage, hiding minor imperfections, increases resale value and resiliency to stains. From garage floor epoxy to concrete staining and decorative concrete, you can count on the South Florida decorative concrete specialists at Southeast Floor Prep for truly customized and cost effective solutions for your concrete flooring. Call us today for more information! 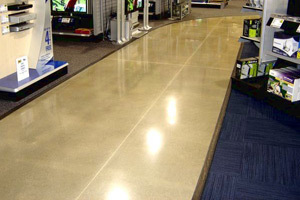 Concrete floor epoxy coatings are a popular, functional, and cost effective way to finish a room or large area. One of the ways that the basic concrete can be treated to create a different look and texture, while also providing a stronger and safer surface, is to have epoxy floor coatings applied. There are numerous benefits in having a garage floor epoxy coatings on a concrete floor, most of which will help to extend the life of the floor, and potentially even make the flooring more functional. Not all South Florida concrete floors are suitable for epoxy floor paint, but with modern materials, most surfaces can be treated to accept the coating without a problem. With Florida concrete floor epoxy coatings, the basic texture of a concrete floor can be changed so that it can be better utilized by a home or business. The coating can have a non-slip substance added to it, or rely just on the properties of the epoxy itself to provide a very slip-resistant surface that can even help in situations where there is some moisture or liquid on the floor. Additionally, certain types of concrete coatings provide a finish that is so strong that it can resist damage from dropped items. Aesthetically, concrete floor epoxy coatings can turn a neutral, grey concrete floor into a vibrant and colorful element of the room that matches the walls and other fixtures. Most epoxy floor coatings can be tinted or colored so that once dry the floor has a distinct color. South Florida decorative concrete professionals can offer a more elaborate coating that matches natural materials such as granite or marble for an elegant appearance. The reflective surface of the epoxy will also refract light into the room from the ground up, increasing the overall brightness of the space. Modern Florida concrete floor epoxy coatings have many technical features that make them an excellent choice for a variety of different rooms. They are available in several different grades, from light coatings suitable for decorative areas, all the way up to very heavy duty coatings that can withstand heavy machinery or cars. Some epoxy finishes are self-leveling for a perfectly flat floor, as well as allowing installers to run the finish up a small portion of the contacting walls for a more professional and consistent appearance. Finally, South Florida concrete floor epoxy coatings are more resistant to staining and is far easier to clean over time than a bare concrete floor. If you are looking for a Concrete Epoxy Floor Coating Company in South Florida then please call toll free at 1-877-GRINDFLOOR (1-877-474-6335) or locally at 561-748-7754 or complete our online request form.